Version 2.2 of WordPress for Android is now available on Google Play. 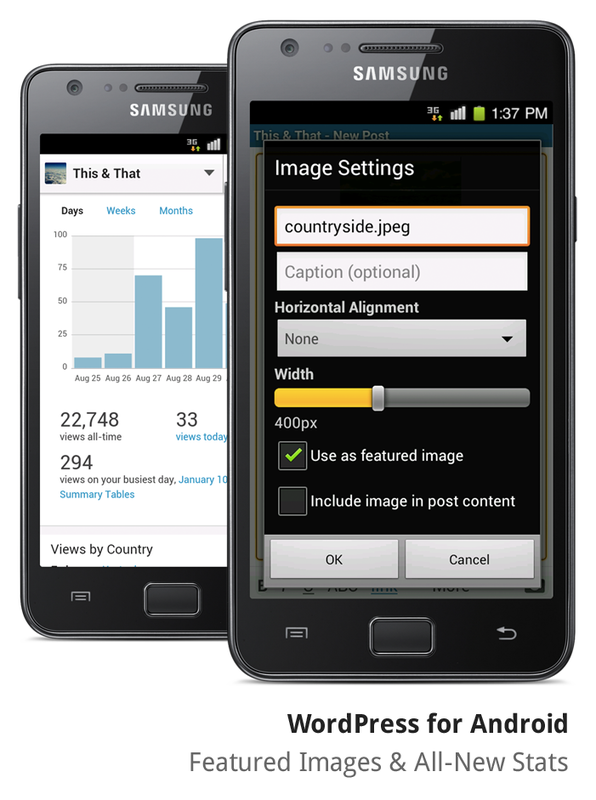 It is full of some great new features that make blogging from your Android device even better! Many WordPress themes now have support for setting featured images, and you can now set them right from the app. To set an image as featured, just tap on it after adding it to the post content area and select the ‘Use as featured image’ checkbox. You can also optionally set the image to also be included in the post content. Note that you’ll need WordPress 3.4.1 or greater and a theme that supports featured images in order to use this feature. Checking your stats from the app can be really handy, and we wanted to make it even better. When accessing stats now, you will see all of the same data that you see when at your blog’s web dashboard including Views by Country and Top Posts & Pages. If you are running a self-hosted blog and want to enable stats in the app, install the free Jetpack plugin. This release also includes some great improvements to the app to make it more reliable and fast. Error messages are easier to read and understand as well. You can see the details on what was taken care of on the trac roadmap. Did you know that WordPress for Android is an open source project? We owe a big thanks to the contributors that made this release possible, including aerych, mrroundhill, frankkanis and aagam94! If you would like to get involved please visit make.wordpress.org/mobile. So what’s next? So far we have plans to improve the ActionBar, post editor and add push notifications for comments. What would you like to see improved in the app? Leave a comment or follow us at @WPAndroid to get in touch!